The PAWS family is saddened to report the recent passing of two very special residents. 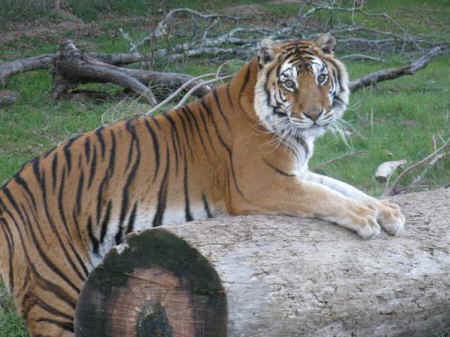 Once at PAWS, she enjoyed sharing her spacious, grassy habitat with several other compatible tigers. Her closest companion was Patty, and the two were never far apart and could often be seen resting under a tree together. After Patty passed away, Ginger seemed to become more fond of the tiger keeper staff. Keeper Al remembers her bright, beautiful eyes and happy demeanor. She also held a special place in supervisor Renae's heart, as she would greet Renae every morning by rubbing against her fence and "chuffing" a friendly greeting. Ginger was in very good health until early in 2015 when she suddenly showed signs that something was wrong. She was diagnosed with kidney disease in February, and medications and supplements helped make her feel better. In June, veterinary staff performed surgery to remove a tumor near her elbow, and biopsies revealed that it was unfortunately a very aggressive type of tumor that would likely grow back. After her surgery, she again rebounded and we saw some of her happy personality return. In August, the tumor began to regrow, and her kidneys began to fail. Because of the terminal nature of her kidney disease, the difficult but most compassionate decision was made to say goodbye. Ginger was euthanized on August 26th, surrounded by the staff who lovingly cared for her. Ginger's estimated age at the time of her death was 16 years. Bambek was one of four African lions rescued from a Bolivian circus by Animal Defenders International and welcomed to permanent sanctuary at PAWS. When they first arrived at ARK 2000 in 2010, Bambek, Camba, Daktari, and Simba were not quite sure what to make of all the space and grass in their new home, but they very quickly realized that they were no longer expected to perform and could spend the rest of their lives relaxing. 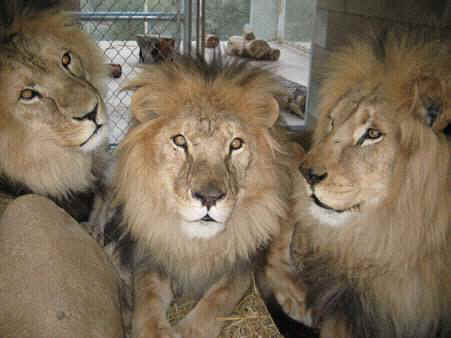 L-R: Simba, Bambek and Daktari, three African lions rescued from the circus in Bolivia, were always together and at night could be found sleeping together in their cozy den. The three male lions were always together, and could often be seen lying in a big pile. During the day they would lie under a big oak tree, their golden manes blowing in the breeze. At night they would sleep together in a cozy den box. After both Daktari and Simba passed away from cancer, Bambek chose to spend his days close to Camba, the Bolivian lioness who lived next door. Arthritis gave a distinctive swagger to his walk and he would "bunny-hop" along the fence with Camba. In early July of this year, Bambek started to have problems with his eyes and it was clear that he did not feel well. PAWS veterinarians performed an examination and discovered that he had cancer. He was prescribed an oral form of chemotherapy that very quickly made him feel better and put his cancer into temporary remission. His appetite improved, his energy level was good, and he would once again walk and bounce along the fence line he shared with Camba. His voice was strong and his distinctive roar was especially musical at sunset. Chemotherapy gave Bambek over two months of quality time. When his appetite and energy level dropped off again, the difficult, but compassionate decision was made to humanely euthanize him. On September 22, while lying in the tall grass under a shady tree in his habitat, Bambek was euthanized. He was surrounded by the love of all who have cared for him at PAWS. This grand old lion, the oldest of the Bolivian lions, and also the gentlest, was estimated to be 23 years old at the time of his death. We will miss his beautiful voice and peaceful demeanor.